Yes, it snows in Hawaii. Matthew Foster is a meteorologist with the National Weather Service in Honolulu. He said he has had to explain the snow to some surprised out-of-state callers. "Typically when we get these snow events, it does get a lot of attention," he said. When it happens, he explains to curious callers that the snow is falling. It comes down in a small, remote area where there are mainly telescopes and scientists. "We do have very high mountains here." Once they realize the heights of the mountains, snow in the island state makes a little more sense, said Ryan Lyman. He is a forecast meteorologist with the Mauna Kea Weather Center. Mauna Kea is nearly 14,000 feet above sea level. 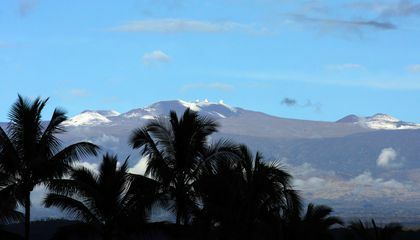 The weather service has said snow has been falling recently on the state's Big Island. Lyman said there has been 30 to 36 inches in recent winters. 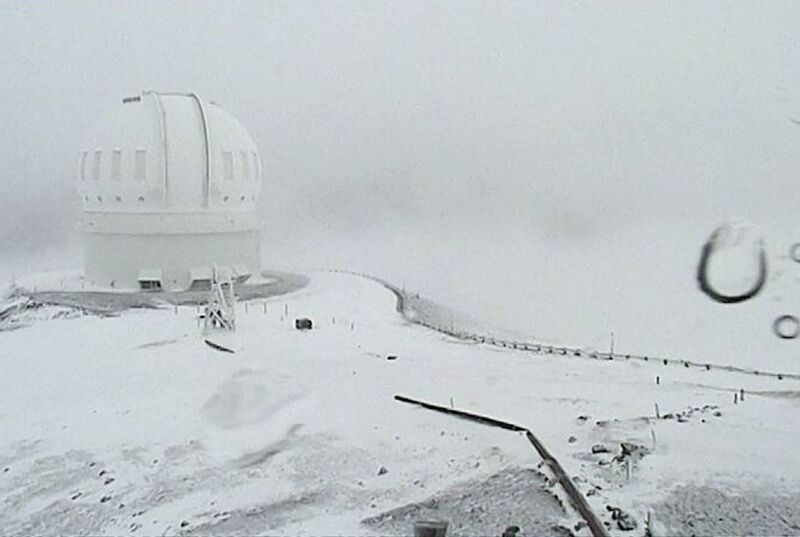 The new snow has shut down operations on Mauna Kea, Lyman said. The mountain's access road is expected to remain closed for days, he said. The weather service doesn't keep track of what the record amounts of snowfall are on the summits. Heavy snow is often accompanied by wind. That creates drifts. They make it difficult to accurately measure snowfall, Lyman said. Abundant snow on Mauna Loa's 13,677-foot summit could be seen at sunset Dec. 1 from parts of Hawaii Volcanoes National Park, said park spokeswoman Jessica Ferracane. How can it snow it Hawaii? It snowed in Hawaii because of the high mountain elevation and the higher you go, the more likely snow will fall during the winter months. I had no idea it actually snowed there. Question: How did it Snow in Hawaii? Comment: I thought that it can never snow at a tropical island. It is all about elevation, my friend. The higher up in the atmosphere, the colder it gets. Yes it can snow on a tropical island it there are high mountains. Snow mountains have snow caps. I didn't know that it snowed in Hawaii. That is because I thought that it was a sunny place. Would you think that it would snow in Hawaii? In response to It snowed in Hawaii I think that it is good that a place like that is getting snow with all of this global warming stuff. In the pacific almost no one gets snow unless your in Washington or northern California. I wouldn't really think that Hawaii being a tropic place would get snow. I suppose it makes sense since Hawaii has very tall mountains. I hope Hawaii keeps getting snow and has a white christmas. I thought that Hawaii was a sunny place. But for the first time is snowed there. Why doesn't it snow in Florida? It doesn't snow in Florida because there are no big mountain ranges. On a mountain, it is so high up that it can snow. But on a flat plain (like Florida), it does not snow, because the altitude is so low. I never knew it could snow in Hawaii after I read seven books about Hawaii. I have a question though, Why doesn't the weather service keep track of the snowfall?